The LAP-BAND System can be an excellent way for many of our patients to effectively lose weight and live a healthier lifestyle. The procedure is minimally invasive, and helps to control portion sizes when eating, ultimately creating a feeling of fullness much sooner during meals. As an extensively trained and board-certified bariatric surgeon, Dr. James Parrish can evaluate you in order to determine if you are a candidate for this procedure. If you do not meet the requirements, Dr. Parrish will recommend an alternative treatment plan in order to help you lose weight and improve your overall health. Please contact us today to schedule a consultation. What Are the Benefits of the LAP-BAND® System? Patients who have had LAP-BAND Adjustable Gastric Banding surgery are typically able to steadily lose weight at a healthy rate. After surgery, you should have minimal scarring, as the procedure is accomplished laparoscopically. This method eliminates the need for large incisions, and works to minimize procedure and recovery time. The LAP-BAND System allows for ongoing absorption of valuable and beneficial nutrients such as Calcium, B12, and Iron. The shape of your stomach will not be permanently altered, and the band can be adjusted to allow for greater or lesser food intake before a feeling of fullness sets in. Since this procedure is reversible, the gastric band can be removed at any time. How Does the LAP-BAND® System Compare with Gastric Bypass Surgery? These two popular weight loss procedures both offer the potential of significant results, and both can cause a patient to feel full faster than they did before the operation. However, several differences exist to separate these two options. Gastric bypass surgery typically achieves greater weight loss initially, and the weight loss is faster and more consistent. The gastric bypass is not easily reversible, while gastric banding can be removed and another treatment tried if desired. Regular checkups will be part of the gastric banding process to adjust the fit and ensure the optimal experience and outcome. And gastric banding is an outpatient procedure, whereas the gastric bypass is a two-day hospital stay, due to the latter’s more involved operation. Dr. Parrish will go over all of your options in detail at your initial consultation and help you decide which approach offers you the best possible result. How Does the LAP-BAND® System Compare with Gastric Sleeve Surgery? Gastric banding and gastric sleeve surgery have many of the same differences as gastric banding and gastric bypass surgery. All of these procedures can make the patient feel full faster during eating, and all of them can achieve significant weight loss. Gastric sleeve surgery is a less complex procedure than a gastric bypass, but it is also irreversible, while gastric banding can be undone. Both require patients to follow a specific diet afterwards, and gastric banding will require routine follow-up appointments to adjust the band as you lose weight. We know that finding the right bariatric surgery for you can be a complicated process, and Dr. Parrish will guide you every step of the way, beginning with helping you choose the ideal weight loss technique for your needs and goals. What Are the Requirements for LAP-BAND® Surgery? As with any weight loss procedure, an evaluation to see if you are a good candidate is the first step. For the LAP-BAND System, patients should have a history of unsuccessfully trying to lose and keep weight off, have a BMI of 35 or higher with a weight-related medical condition, or 40 and higher without weight-related medical conditions, and be 18 years of age or older. If you have a BMI of 50 or higher, another procedure may be better suited to your needs or you may be asked to lose some weight initially before trying LAP-BAND surgery. 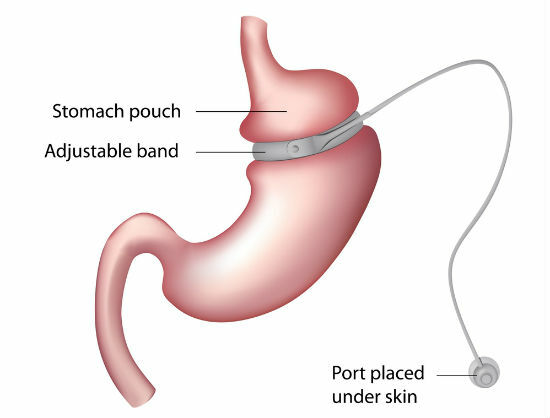 What Should I Expect During the LAP-BAND® Adjustable Gastric Band Procedure? During LAP-BAND System surgery, Dr. Parrish will section off the upper portion of the stomach by laparoscopically inserting and attaching a saline-filled adjustable band. Once attached, the band creates a small pouch in the upper portion of the stomach. The pouch allows you to limit your food intake and feel full much earlier than usual while eating. The amount of food you are able to consume before achieving a feeling of fullness can be increased or decreased postoperatively by adjusting the amount of saline in the band. This can be performed as a simple office procedure. What Should I Expect During LAP-BAND® Recovery? Because we use a laparoscopic procedure to insert the LAP-BAND System, recovery times are generally short. The procedure is done on an outpatient basis, and most of our patients have been able to gradually return to their daily activities after a few days. We will schedule regular follow-up appointments with you over the ensuing year to make sure you are losing weight safely and effectively. What Are the Typical LAP-BAND® System Results? Patients from across America have experienced successful results with LAP-BAND System surgery, shedding hundreds of pounds and turning their lives around. After the LAP-BAND System procedure, it is important to continue working towards a healthier lifestyle. This surgery is intended to assist people on the road to becoming healthier; it is not a cure for morbid obesity by any means. Our practice offers excellent resources to help our patients maintain a healthy weight after surgery and continue to make positive lifestyle changes. Staying on track after surgery can be difficult to do alone, so we encourage our patients to join one of our support groups and follow nutritional guidelines to help them through the process. Dr. Parrish and his team of medical weight loss professionals are here to support you, and we will provide you with information and materials to help you throughout your weight loss journey. Are There Any LAP-BAND® Side Effects? Most people have minimal side effects after receiving gastric banding; however, nausea, vomiting, and ulceration at the band site have been reported in rare cases. Other potential side effects can include indigestion, weight regain, and dehydration, so it’s very important to follow the instructions about diet and care to minimize the risk of these issues and to achieve the desired weight loss as safely as possible. Constipation is a more common problem, and we can recommend some solutions to help limit its development. Unlike some other bariatric procedures, vitamin and nutrient deficiencies are not typically seen. Are There Any LAP-BAND® Complications? Due to the minimally invasive approach and reversible nature of the gastric banding procedure, surgical complications are quite rare. Some patients may experience band slippage—when the band moves out of place—or stomach erosion in the event of mechanical malfunction or anatomical rejection, although these issues are unusual and not common. We will monitor your band and your health often to reduce the risk of complications and to provide the best possible care for you as you lose weight and achieve a healthier lifestyle. How Much Does LAP-BAND® Surgery Cost? The price of LAP-BAND surgery can vary from location to location, doctor to doctor. 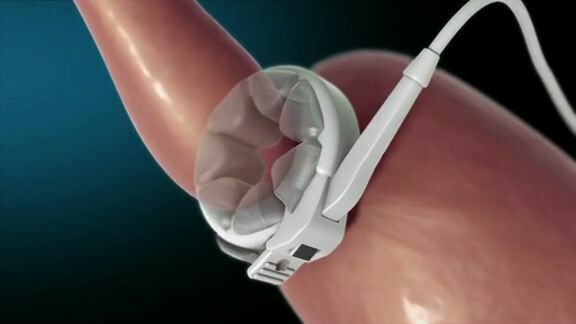 At our practice, the cost of gastric banding is approximately $12,000, including anesthesia and hospital facility fees. We will review the total cost of your program with you in full during your consultation so that you are well-informed. Our medical team will work with you and your medical insurance to cover the cost of care. If desired, we offer weight loss financing for patients paying out of pocket. If you feel that you may be able to benefit from LAP-BAND Adjustable Gastric Banding, or perhaps another form of bariatric surgery, please contact us today to schedule a consultation with Dr. James Parrish.